For $1,300, Could This 1999 Isuzu Amigo Become Your New Best Friend? Joe Isuzu got famous for lying like a rug—that was his schtick. His corporate masters would have preferred his fame arose from selling cars, but that was not to be. One car that they did sell was today’s Nice Price or Crack Pipe Amigo and we’ll need to decide if its current price is a deal and that’s no lie. Okay people, let’s get one thing straight, lowering cars ain’t like raising hemlines, you can go too far. Yesterday’s 1984 Volvo 245 was dropped—maybe not too far—but still enough to be noteworthy. That was most likely when riding over sleeping policemen or substantial dips in the road. Contrastingly, it’s price was seen as too high, coming in at a 60% Crack pipe loss, much to the chagrin of the bevy of Volvo loves we have around here, among which you can count yours truly. My wife and I in fact attended Volvo’s 60th anniversary here in the States last year. There we giggled when hearing both the company’s CEO, Lex Kerssemakers and Jay Leno pronounce the brand’s name as Vahl-voe. It’s how we say it now. And then we giggle some more. Another company name that once had pronunciation issues here in the U.S. was Isuzu. Back before the company hired David Leisure to create the character of Joe Isuzu they ran an ad in which caucasians struggled to say Isuzu and then which ended with an Asian man commiserating that he couldn’t say Chevrolet. It was endearing and mildly racist. Today’s 1999 Isuzu Amigo looks pretty endearing, and not the least bit racist so let’s give it the once over. The truck has 146,000 miles under its belt and the cool hard/soft convertible top that echoes the style of Porsche’s original 901 Targa. The truck is located in Las Vegas, and the harsh Nevada (Nuh-VAD-uh) sun has baked the clear coat off on the hood. That’s nothing driving exclusively at night won’t fix. The convertible top seems a bit lumpy and tired, but at least it’s intact. No rust, major dents, or missing bits mar the truck either. On to the interior where everything appears equally tidy. There looks to be an upgraded head unit in the dash, but other than that, nothing to get too excited about in here. Mechanicals are comprised of a 3.2-litre, 205-bhp V6 and a four-speed automatic transmission. It’s a 4X2 so don’t plan on taking it on the Rubicon, but it should acquit itself quite nicely on the road. The seller says it passed California smog in 2015 (perhaps I spoke unfalteringly too soon about that Nevada sun) and has had a recent sprucing up under the hood. It’s described charitably in the ad as a “tough tank.” Somewhat cryptically however the seller also says that this Amigo needs a new ignition coil. The truck apparently drives, so the current one couldn’t have totally failed or have gone missing, but that is a weird thing to have go bad. These have coil-on-plug units (times six) and RockAuto.com says they can be had for as little as $34 a piece. That coil-needing business is the only fly in the ointment here in the ad, which otherwise has the truck smelling of roses. That issue may actually foretell other engine maladies, so a good going over by someone who knows these things would be warranted before exchanging cash for its advertised clean title. Or you could just wing it, he’s only asking $1,300 for it. 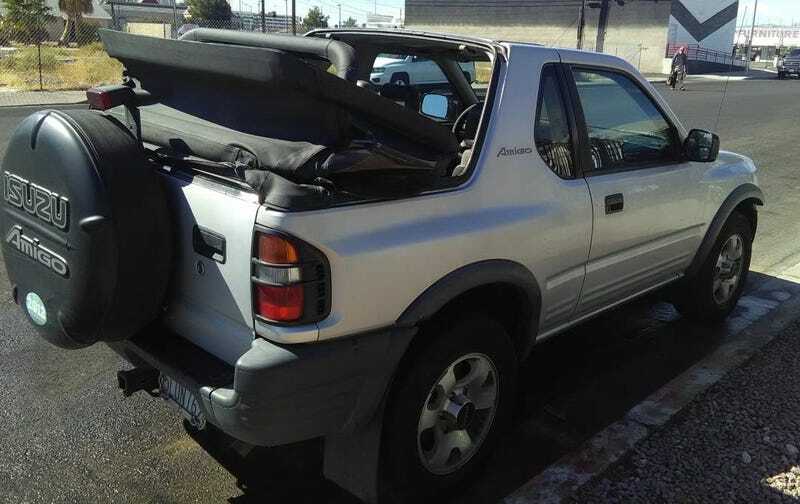 What do you think about this Isuzu with that mystery malady and that $1,300 price? Is that low enough for someone to pick it up “as-is?” Or, does what the ad does NOT say tell you to stay away? Viva Las Vegas Craigslist, or go here if the ad disappears. Would You Drop $7,500 On This Dropped 1984 Volvo 245 Wagon?